The first virtual reality production 'Mutter und Sohn = Realität trifft Kunst (Z.U.K.U.N.F.T. der Unendlichkeit)' by Jonathan Meese and his mother Brigitte Meese is a journey into the heart of the dictatorship of art. In the artist’s virtual studio, the spectators witness the emergence of a 360°-Gesamtkunstwerk of the future: The sleeping artist is visited by wonderful, inspiring dreams. His mother enters, brings him coffee and urges him to paint. Another Mother Meese comes in, and another, and another… and the artist paints in a frenzy of creation, because “art is just to get started, and right away it’s more awesome than Picasso” (Jonathan Meese). While Clouzot’s famous film “Le mystère Picasso” (1956) showed the creative act on a two-dimensional plane, here the spectators are right inside the events, entering into their mysteries. The white studio space becomes a multidimensional screen. Several mothers enter, commenting, evaluating and provoking a work that is a reflection on Alfred Hitchcock, Anthony Perkins, Richard Wagner and Joseph Beuys. It leads to a compelling insight: Everybody is an artist, at least beneath these VR-googles. In a cooperation project with ARTE spanning several years, Berliner Festspiele/Immersion and invited artists are exploring the potentials and limits of Virtual Reality Experience and 360°-film. This technology has been inspiring game developers for years, and artists are also beginning to experiment with VR to open up and explore new spaces for art. 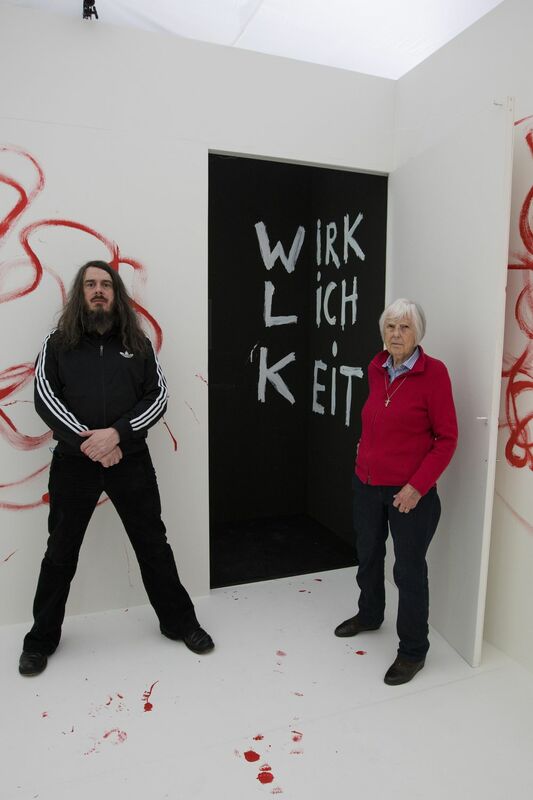 For the initial presentation from 21 to 29 April 2018, the room designed by Jonathan Meese will be reconstructed at Gropius Bau. Visitors will be able to witness the creation of an artwork within an artwork. From this time, the film will also be available via the free ARTE360 VR-app for iOs, Android, GearVR and Daydream as well as on ARTE’s website.